Day 3 of the Delcam Asian Technical Summit 2012 contained a number of presentations from Delcam employees and customers. I found the presentation by Delcam’s Marketing Manager Peter Dickin particularly interesting. It was about Vortex and MachineDNA, a couple of new technologies that Delcam has been working on. Vortex is a patent pending high speed machining (HSM) roughing strategy designed for solid carbide tooling. It takes advantage of the ability of carbide tools to cut on the side. All other CAM software vary the feed rate as the tool moves in and out of corners. The reason for doing this is at corners the tool needs to cut more material than it would if it were moving along a straight line and as such the straight line feed rate doesn’t work. So CAM software decrease the feed rate as the tool moves into a corner and then increases the feed rate back to the original value as it move out of the corner. Vortex employes a constant feed rate strategy in a unique way. This results in a tremendous saving in time and hence money. The video below shows how Vortex works. 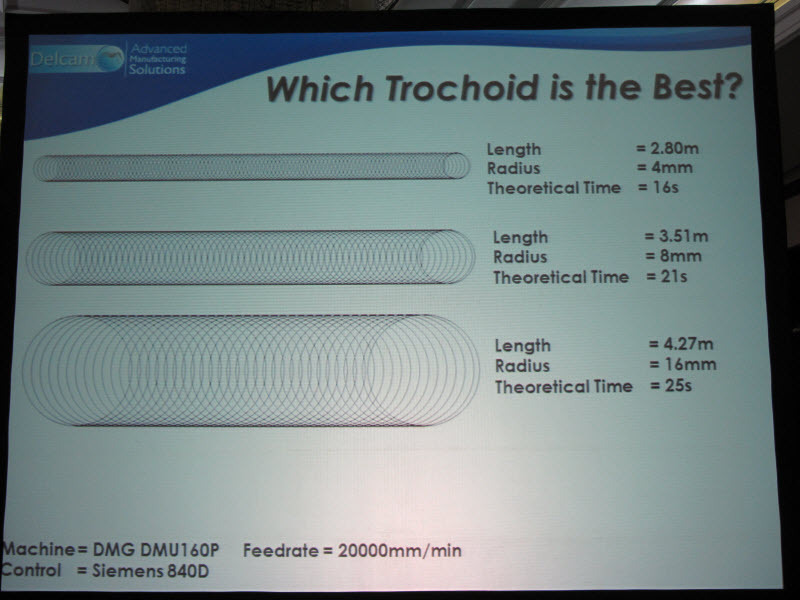 MachineDNA is a unique technology that automatically determines the most efficient trochoid size for Vortex. 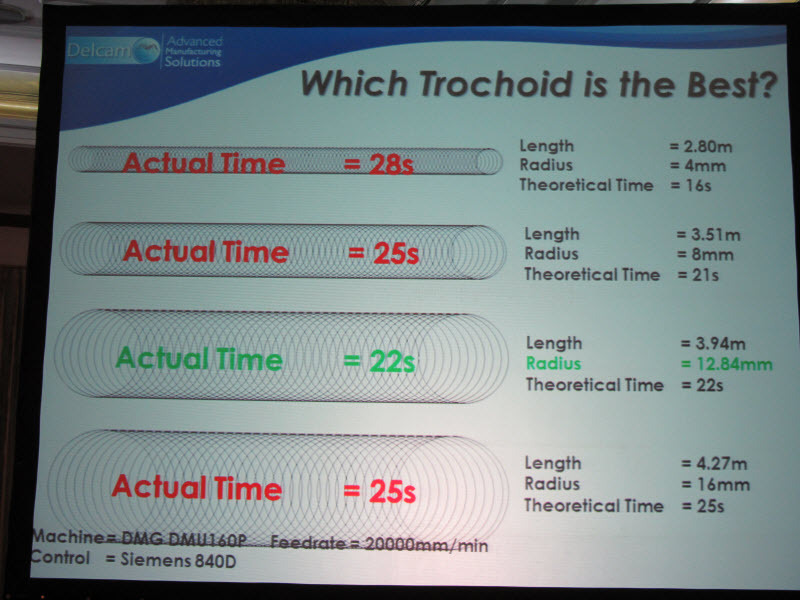 This picture shows three possible trochoid options and we can’t be sure which takes the shortest time. This is what MachineDNA computes as optimal. 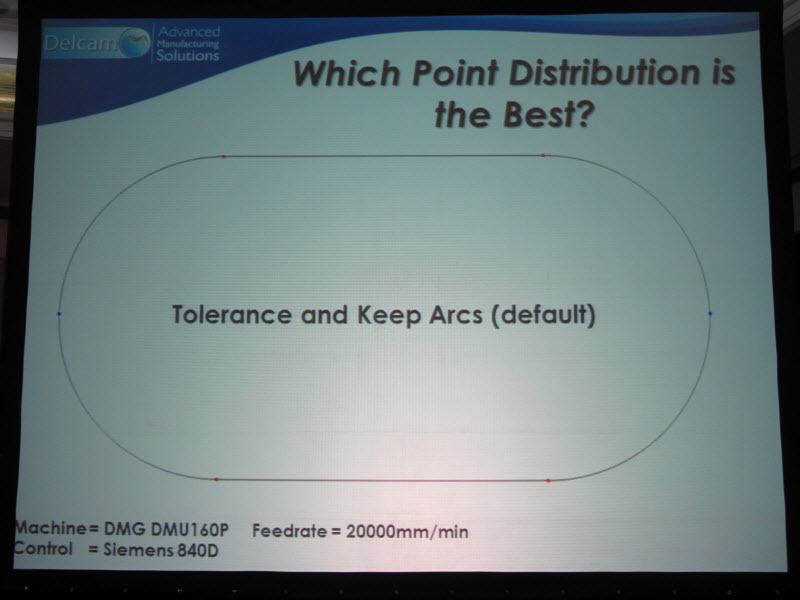 MachineDNA can also figure out the best point distribution in a tool path. No matter what the CAM systems shows you on the screen, arcs are broken down to short line segments when it comes down to actually machining the part. So the manner in which curves are broken down to line segments is important and affects part quality and machining time. Consider this simple tool path containing two line segments and two arcs. The default behavior is to keep the line segments as they are and break down the arcs into short line segments based on a supplied tolerance. 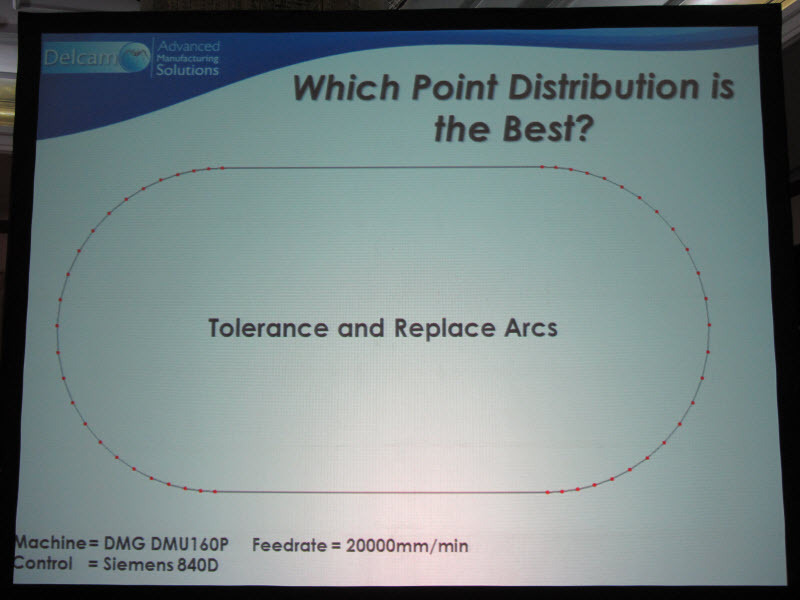 Another option is to replace the arcs with unequal line segments. 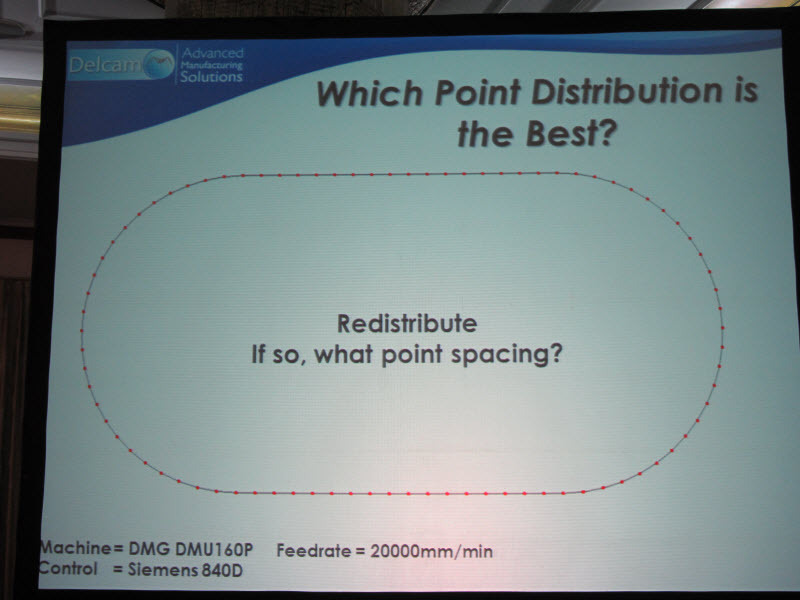 We could also redistribute points across the entire tool path. This is what MachineDNA does. It maintains the tolerance and replaces the arcs taking care of curvature continuity. Vortex and MachineDNA are still being tested in Delcam’s machine shop in Birmingham, UK. The company has rolled out a beta program for customers to try out these technologies and they are already getting feedback. 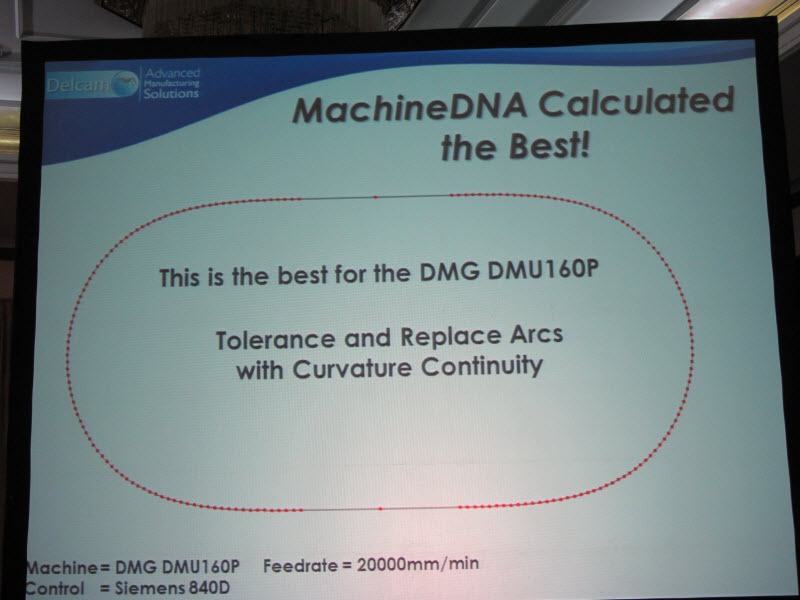 If all goes well Delcam plans on releasing Vortex and MachineDNA to customers by the end of 2012.